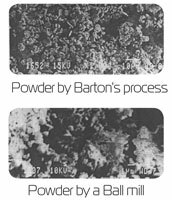 Tetra Oxide Power (TOP) paste preparation technology is based on Barton’s Process, during which lead ingots are first melted and then fed into the pot, where air is blown over molten lead to produce a fine stream of lead droplets. The droplets react with oxygen in the air to form the oxide, which consists of a core of lead with a lead oxide (PbO) coating. The resulting lead powder consists of particles of pure tetragonal form (regular pyramid). Active paste made of this powder has more capacity and battery electodes have higher cranking power, compared with electrode paste of powder produced by a Ball Mill.